The furniture store that I am employed by sells decor accessories from Kalalou. 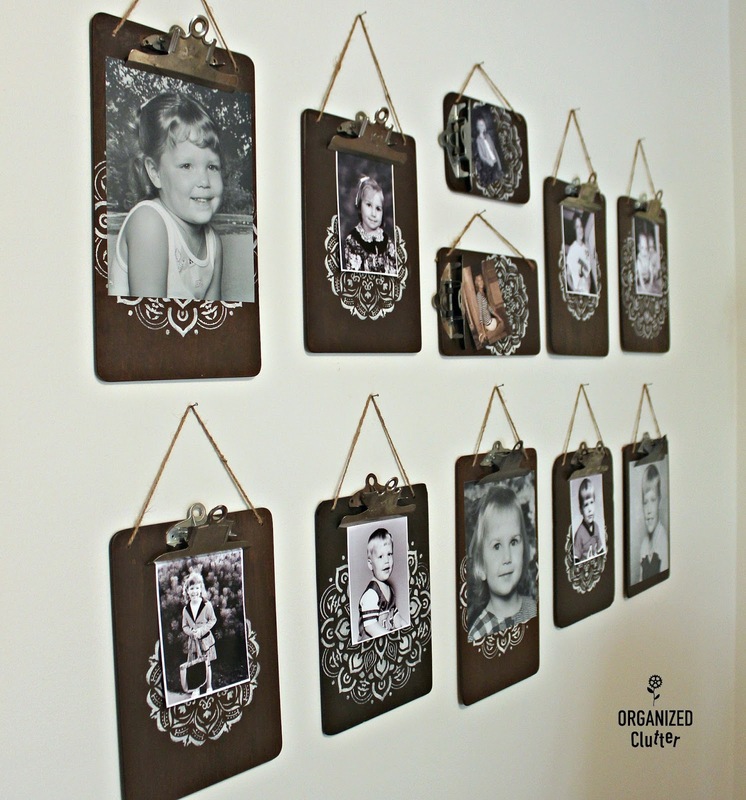 I was recently inspired by Kalalou's Clip Board Photo/note Holders gallery wall. The Kalalou clipboards are black, but I used Minwax water based walnut stain to even out the color variations and water stains on my thrift shop/garage sale clipboard collection. I drilled holes in the top corners of the larger clipboards, and I stenciled a mandala or "doily" looking stencil on the clipboards using a Home Depot Decoart Stencil, a Hobby Lobby Stencil, and light ivory craft paint. I had two smaller clipboards that I hung horizontally, mostly just to add some assymmetry to the clipboard wall lineup. 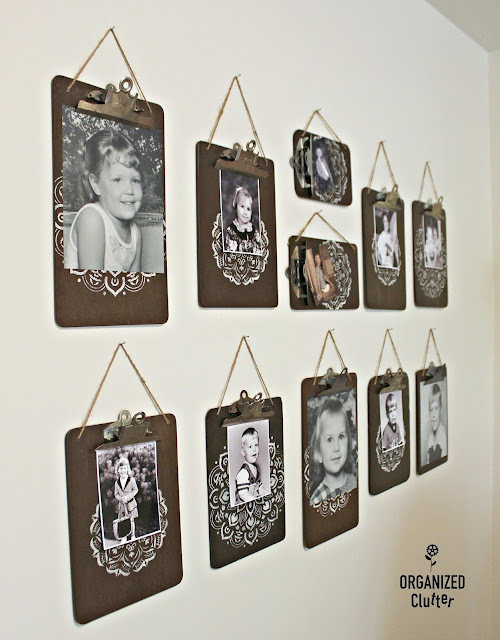 Here is my bedroom clipboard gallery wall with childhood photos of my grown children! If you don't want to amass a clipboard collection, you can buy a set of 6 clipboards from Amazon! That is a very awesome display. I think your wall looks better than the Kalalou wall! Great job! 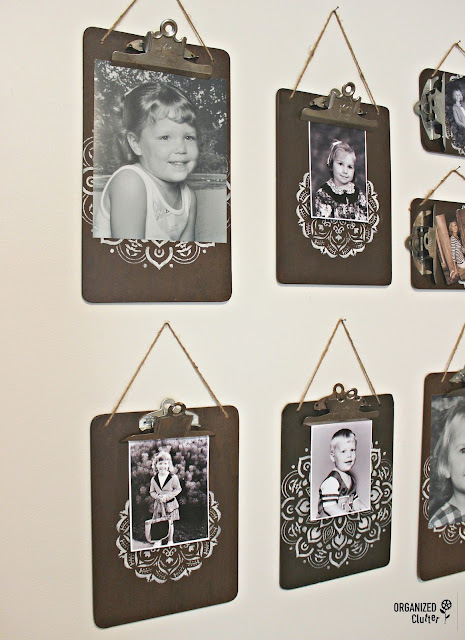 I love clipboards for display...your gallery wall is wonderful! I think these old clipboards are so beautiful that I have a few and they are hanging empty on my wall. However, after seeing what you did to yours, I love them even better. Hans for sharing. 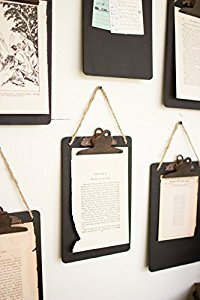 Is there a way to tell if a clipboard is "vintage"? The older ones are thicker pasteboard, a little darker and have a heavier duty clip.